You are here: Home / Blog / Cosmetic Dentistry / The best prices for dental implants are in Cancun Cosmetic Dentistry! Regular dental implants are the best option to replace one missing tooth, fixing the gap of your smile. This dental implant price includes the crown, abutment conector and the dental implant titanium screw. Usually, the mere screw will cost $3,000 USD in USA but for only a limited time, you will be able to get the whole treatment just for $1399 USD! Snap in Dentures are one of our most popular smile makeover treatments. We specialize in these amazing mini implant dentures that can give you your smile back in just 8 days. There are many benefits for the Snap in Dentures, including a strong bite thanks to its primary stability. These implant dentures don’t have roof of the palate and are also removable, so you can clean them with a toothbrush. Until the end of April, the full cost of this palateless denture mini implant treatment is only of $12,000 USD, which includes 8 extractions, local anesthesia and bone regularization. You won’t find a better price for a full makeover like this. All-on-4 is considered one of the most advanced dental implant protocols used for mouth restorations. They have the highest chance of long term success because of the way the dental implants are placed in the jaw bone. This is an fixed implant denture solution and it will be only removed when you come for a professional cleaning once a year. The All-on-4 Mexico cost of this treatment for one arch is $10,000 USD, which is a fraction of what you would pay in USA. *Restrictions apply. Does not include sedation. Not valid with any other deal or discount. Valid until 04/30/2018. 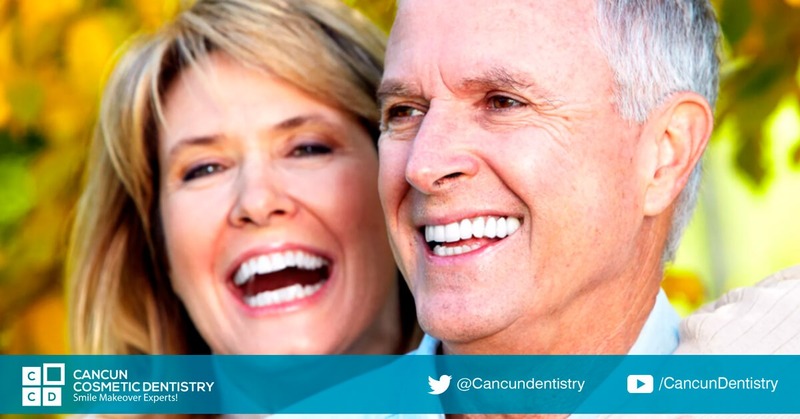 Take care of your smile on your vacation in Cancun! She loved the kind and caring staff at our dental clinic in Cancun!